Next question: were those mistakes caught because of the attention the DP gets? What if all convictions got the same scrutiny? 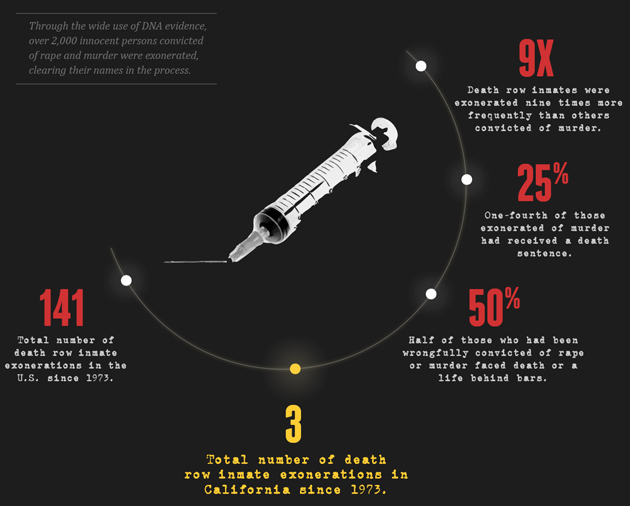 A 2013 infographic study by the California Innocence Project puts the cost in California at a staggering $4 billion since 1978. Statistics contained in this report, when overlayed with the national increase of exonerations ( now at 1793) , in the US runs counterpoint to the presence of the death penalty (subject to decades of appeals) as a constitutional (8th amendment) “deterrent” to violent crime. The forensic science connection comes from the sad fact that of the 1793 exons, an unacceptable number of forensic examiners have fumbled the ball regarding false or misleading testimony. See the cases. Previous Previous post: this day in crime history: may 18, 1927 — Nobody Move!